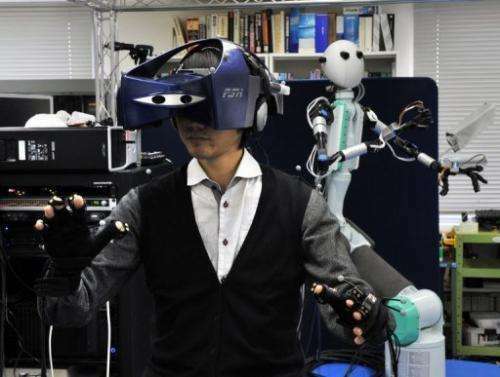 An operator -- wearing a special HMD and a pair of gloves -- controls the "Telesar V" (right) that was developed by Keio University's Graduate School professor Susumu Tachi (not in the picture) at his laboratory in Yokohama, suburban Tokyo. The robot that mimics the movements of its human controller is bringing the Hollywood blockbuster "Avatar" one step closer to reality. 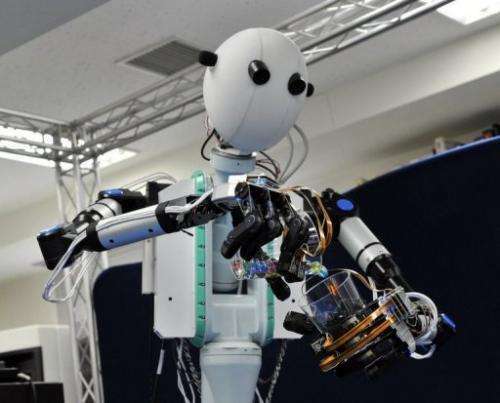 A Japanese-developed robot that mimics the movements of its human controller is bringing the Hollywood blockbuster "Avatar" one step closer to reality. Users of the TELESAR V don special equipment that allows them not only to direct the actions of a remote machine, but also to see, hear and feel the same things as their doppelganger android. "When I put on the devices and move my body, I see my hands having turned into the robot hands. When I move my head, I get a different view from the one I had before," said researcher Sho Kamuro. "It's a strange experience that makes you wonder if you've really become a robot," he told AFP. 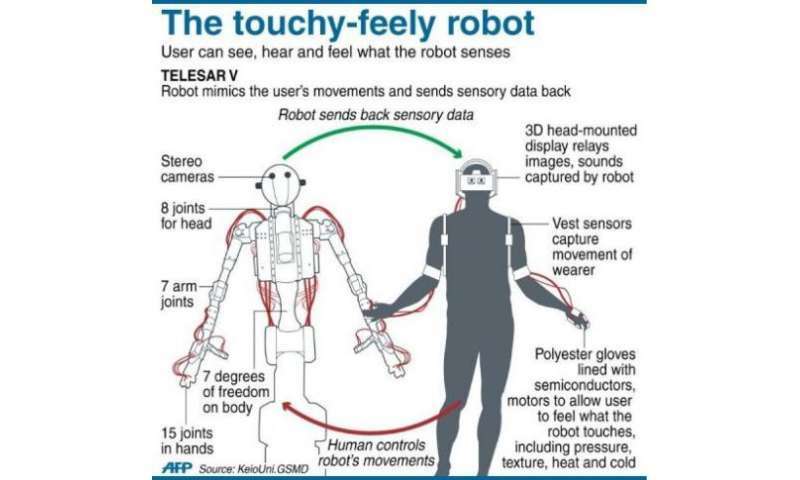 Professor Susumu Tachi, who specialises in engineering and virtual reality at Keio University's Graduate School of Media Design, said systems attached to the operator's headgear, vest and gloves send detailed instructions to the robot, which then mimics the user's every move. At the same time, an array of sensors on the android relays a stream of information which is converted into sensations for the user. The thin polyester gloves the operator wears are lined with semiconductors and tiny motors to allow the user to "feel" what the mechanical hands are touching -- a smooth or a bumpy surface as well as heat and cold. The robot's "eyes" are actually cameras capturing images that appear on tiny video screens in front of the user's eyes, allowing them to see in three dimensions. Microphones on the robot pick up sounds, while its speakers allow the operator to make his voice heard by those near the machine. The TELESAR -- TELexistence Surrogate Anthropomorphic Robot -- is still a far cry from the futuristic creations of James Cameron's "Avatar", where US soldiers are able to remotely control the genetically engineered bodies of an extra-terrestrial race they wish to subdue. But, says Tachi, it could have much more immediate -- and benign -- applications, such as working in high-risk environments, for example the inside of Japan's crippled Fukushima nuclear plant, though it is early days. A master-slave robot "Telesar V", developed by Keio University's Graduate School of Media Design professor Susumu Tachi transfers marbles from a cup to another cup during a demonstration at Tachi's laboratory in Yokohama, suburban Tokyo, on February 8. The robot that mimics the movements of its human controller is bringing the Hollywood blockbuster "Avatar" one step closer to reality. "I think further research and development could enable this to go into areas too dangerous for humans and do jobs that require human skills," he said. Japan's famously advanced robot technology was found wanting during the crisis at Fukushima, where foreign expertise had to be called on for the machines that went inside reactor buildings as nuclear meltdowns began. Tachi said a "safety myth" had grown up around atomic technology, preventing research on the kind of machines that could help in the wake of a disaster. But he said his kind of robot technology could help with the long and difficult task of decommissioning reactors at Fukushima -- a process that could take three decades. A remote-controlled android that allows its user to experience what is happening far away may have more than just industrial applications, he added. "This could be used to talk with your grandpa or grandma living in a remote place and deepen communications," he said. ...or send the robot to Amazon rainforest into a native tribe to experience the real life Avatar experience. Please read up on entanglement and information theory before posting such stuff. If we put those avatars in a boxing match like in "Real Steel," then what would my opponent feel when I give his avatar a KO punch? I really, really wish Heinlein's term "waldo" could be used in lieu of "robot" for remote human-operated equipment. When "robot" is used promiscuously to describe both autonomous machines and completely un-autonomous machines, clarity for the term "robot" is utterly lost. The term waldo was used briefly, back in the day, for remote manipulators. However, these were very limited in capability and the word robotic has come to mean a much more sophisticated set of capabilities (though it's still applied to robotic arms used in assembly say). The comparison would be more apt if it noted that the TELESAR is actually a lot closer, both in concept and in engineering, to the "Amplified Mobility Platform" (AMP) exoskeletons that were being used in the movie. Can you picture there reaction to a Robot? ....or Daemon as they would call it LoL. Why not save the expense of the robot and create a suit for a human avatar? The "operator" sees, hears, feels what the avatar does and perhaps visa-versa. Good for having highly skilled operators perform work through less-skilled avatars. When "robot" is used promiscuously to describe both autonomous machines and completely un-autonomous machines, clarity for the term "robot" is utterly lost. The term "robot" comes from the Czech "robota" which simply means "work" or "unfree labor". So it's pertinent for all sorts of machines - not just autonomous ones (actually less so to autonomous ones). this isnt the way it worked in avatar. geesh, some research please first? this guy is remote controlling a robot FROM the rig he is wearing. in avatar they transferred their minds into cloned alien bodies. Ya, a good idea for a show,... better than 'an idiot abroad'. Yes and very true but this as close as we'll get for a while so using Avatar as areference is fine for now.